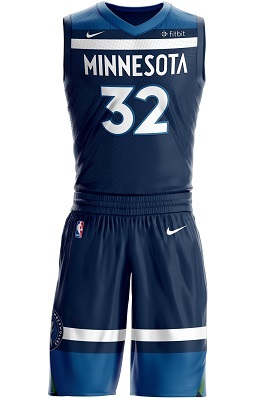 The new Timberwolves uniforms, made by Nike, are here. The team released two of the four primary designs this morning. The new Timberwolves uniforms, made by Nike, are here. The team released two of the four primary designs Thursday morning. The “Icon” edition is the darker one, while the “Association” edition is the lighter one. And yes, the Fitbit logo is on it, as promised. If you followed the leaks of the jerseys that trickled out in recent days, the designs shouldn’t be a surprise. They look pretty much exactly like what Karl-Anthony Towns was wearing in a leaked video game image. There will be two more primary uniforms released in the coming months, as the NBA is going to four total uniforms — with no home or away designation — in this reboot with Nike. It’s interesting to note that the new jerseys won’t be available for purchase until Sept. 29. Also, if you are one for reading a lot into a small detail, it should be noted that Andrew Wiggins’ jersey is included in both the video and still images released by the team. I’m not sure they would do that if he was under consideration to be traded for Kyrie Irving … though I suppose it would look even more conspicuous if he was left out. You can get more details on the jerseys and the history right here. Here’s a look at the full Icon look, including shorts. I have to say — and I’m not just saying this because Glen Taylor owns both the Star Tribune and the Timberwolves — I really like the new look. Plenty of you probably agree. Maybe just as many of you disagree. Let’s hash it out in the comments.